If you are not already taking advantage of bittorrents, then you are missing out on an amazing trend. Ever since bittorrents came into existence in 2006, they have been used by billions of users to share their favorite music, movies, digital books, software and more across what are known as peer-to-peer file sharing networks. A bittorrent is at its core nothing more than a ‘pointer’ that helps two or more people transfer files through a P2P network. The problem with such P2P networks, however, is that they are not at all safe. Whenever you transfer to such a network without the proper protection, you place your information and computer at grave risk. Your computer could be hacked. You could wind up with a virus. Or someone could get hold of your passwords. 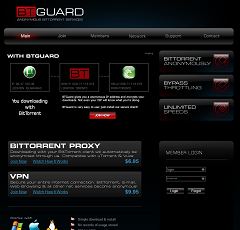 It just so happens that a special technology exists to help protect you: BTGuard is a specialized VPN designed for dealing with bittorrents safely and anonymously. The proliferation of anti-piracy laws and NSA surveillance has left many Americans afraid to use the Internet. People rightfully feel like the government watches their every move. This makes them uncomfortable, because who doesn’t like his or her privacy? Step into the fold BTGuard, a Canadian company that benefits from the lack of data retention laws in its home country. This means that BTGuard is able to conduct business without having to closely track and monitor its clientele’s activities. This makes BTGuard the most perfect virtual private network company in the industry. Before we look at BTGuard in more detail, it is fundamental that you understand VPN technology. A VPN is a tunnel. When you establish a connection with a VPN provider like BTGuard, your network tunnels over to BTGuard and then accesses the Internet. This means that get to browse the Web anonymously without having to worry about somebody tracking you down. Why? It is because all your data is safe with the previously mentioned tunnel. You can access any and all websites, regardless of any local, statewide or national restrictions. For instance, imagine being able to access Facebook from your work computer. Or imagine being able to access Facebook while drinking coffee at a Starbucks in Beijing. You can hide your IP address and personal details like credit card numbers and more. The VPN basically acts like an added layer of network security. Everything about you and your computer remains in the tunnel. Networks and applications you access only see details about BTGuard. You can avoid commonly transmitted viruses and spamware. The VPN automatically blocks millions of known malicious files and attacks. There is almost no chance that a virus will penetrate the tunnel and thus infiltrate your personal home computer system. You can more comfortably take advantage of WiFi. If you connect to the Internet directly through a WiFi network, your data is put at great risk. If instead you go through a VPN, nobody else on that same WiFi network can access or see your information. This is especially useful for when you tap into public WiFi networks. BTGuard offers two specific types of VPN services. Available for $6.95 a month, the BitTorrent Proxy VPN service offers bittorrent users the chance to download and share files safely and anonymously. Note that this is not a free pass to share or partake in illegal, copyrighted content. It is rather a simple security measure designed to offer bittorrent users more security and peace of mind than they are currently receiving. The installation of damaging files. The exposure of personal information. BTGuard’s full-fledged VPN service offers you a fully operational, 24/7 VPN connection for only $9.95 a month. The service comes with 256-bit AES OpenVPN encryption, not to mention 128-bit PPTP. The latter, PPTP, is a Mobile-compatible algorithm that works with iPhone, iPod Touch, Android and Windows Mobile devices. Generally, we recommend going with the full VPN solution, unless you happen to be a frequent bittorrent user. In that case, you may be better off investing in the proxy. Signing up and paying is extraordinarily easy. The neat thing is that BTGuard accepts credit cards, PayPal and even bitcoins. You register and pay online directly through the website. No fancy identification checks are required. You just need to be able to pay, and that is about it. Once you set up your account, you will need to download the open-source software suite known as OpenVPN. It’s a pretty small file, and it installs very quickly. Once it is installed, you’ll need to configure its properties with the instructions sent to you by BTguard. This is also easy to do. Once connected, you’re all set to go and can browse the Internet safely and anonymously. And if you experience any problems during the setup process, you can reach out for help through BTGuard’s ticket system. It keeps absolutely zero logs and records regarding it customers and clients. It offers high-quality encryption algorithms that are not easily cracked. It maintains decent VPN speeds. They aren’t as fast as non-VPN speeds, but still. 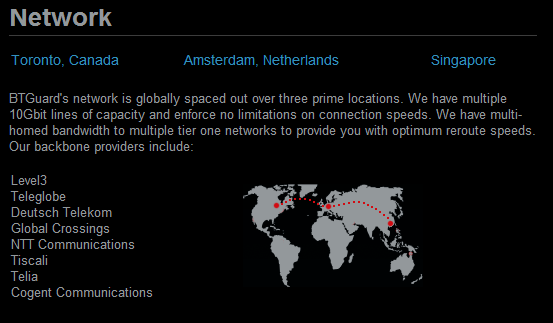 It offers servers in three key points across the world. It supports Windows, Mac OS X and Linux computers. Its software is compatible with iPhones, iPads and Android devices. It offers very affordable prices for its services. The key drawback to VPN technology is that it results in significantly lower network speeds. Unfortunately, this is a price that must be paid for extra-level security and protection. It is in fact something that you would experience with any virtual private network, regardless of the provider. However, the torrents we processed through BTGuard still managed to transmit at 3.4 MB/s, which is not bad with a proxy. Likewise, the general VPN performed decently as well. Another issue with BTGuard is that not all bittorrent clients support it. You may as a result have to change your primary bittorrent client. 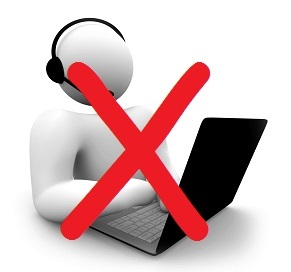 Unfortunately, BTGuard also suffers a bit when it comes to customer service and support. There is no way to chat with staff members from the company. Instead you must use the ticket system to create a ticket and then wait for a reply. Your only other option is to take advantage of the website’s extensive knowledgebase section, which does admittedly contain a bevy of useful and comprehensive information, including a FAQ. Can I invest in both the proxy and the VPN? You cannot do this. Each account can only access one service. If you cannot decide between these two, then we highly recommended you opt for the slightly more expensive VPN option. It is the more comprehensive solution. Can I switch my account type? You can switch from a proxy to the VPN or vice versa. However, you must first cancel your current subscription and then start a new one. Can BTGuard be used from anywhere? You can access BTGuard’s services from anywhere, so long as you have access to the Internet, and so long as you have downloaded and installed OpenVPN. Note that this software is compatible with desktops, laptops and mobile devices. Can I use BTGuard on multiple computers? You can use BTGuard’s services on multiple systems, but not at the same time. If you log in from your home computer and then a friend logs in on another computer, you could risk having your account terminated. Overall, we found BTGuard to be a reliable and decently fast VPN provider. It caters both to bittorrent users, as well as anyone seeking safer and more confidential Web browsing. More importantly, it offers the safety and security anybody in this NSA-dominated age would want. The only major fault we found with BTGuard was related to its customer care program. The good news is that we did not even need to rely on customer support once throughout the whole test. We managed to register an account, install the software and setup our VPN without any assistance. In conclusion, if you want to safeguard your information and retain your privacy as you trade bittorrents or surf the Web, then we definitely recommend that you invest in the very budget-friendly BTGuard service.